Courtesy of Run the Rockies and Town of Frisco. 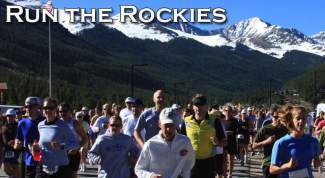 Registration is now open for the 37th annual Salomon Run the Rockies weekend, June 8-9. Registration is available online at http://www.RuntheRockies.com. Current discounted prices are $50 for the half marathon, $40 for the 10K. The trail race registration is $40 for the 5K and 10K. Prices go up May 1. Day-of registration will be available for both races. Registration for the road race on June 8 is available at the Frisco Recreation Building at Third Avenue and Main Street from 6-8 a.m. Day-of registration for the 5K and 10K trail races will be available at the Frisco Day Lodge from 7-8 a.m. on Sunday, June 9. For more information, please contact Linsey Kach at (970) 668-9133 or linseyk@townoffrisco.com.